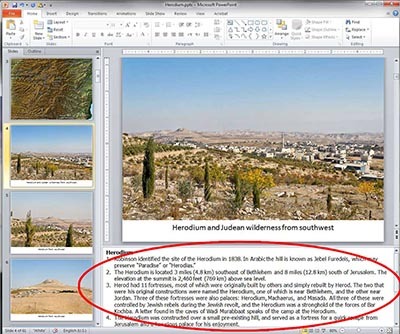 Biblical, historical, geographical, and archaeological notes are included in the “Speaker’s Notes” section of the PowerPoint presentations. This allows the association of annotations with specific sites and photographs. This has the additional advantage of working across different operating platforms (e.g., PC, Mac), but it requires a full version of the PowerPoint program or Keynote ’09. Alternative programs to PowerPoint may not display the “Speaker’s Notes” properly. Annotations have been written for all volumes of the Pictorial Library of Bible Lands, but not every slide is annotated. Sometimes an explanation is given with the first relevant slide, and notes are not supplied with further slides on the same subject. In some cases, photographs are annotated with quotations from the Bible or other historical sources. The annotations are the result of many years of research, teaching, and writing, totaling more than 2,000 pages. Below are some examples of the historical, geographical, and archaeological explanations added to the photographs. Note: these are not the extent of notes on any given subject, but they are the notes associated with this particular photograph. For instance, there are a dozen photographs of the Capernaum synagogue and different notes are given for each slide. Benches on which the elders sat lined the inside wall. There were probably mats on the floor inside the synagogue for people to sit on (Strange and Shanks 1983: 26). The architrave was originally a single piece of limestone, but it has been broken. The corner columns are heart shaped. 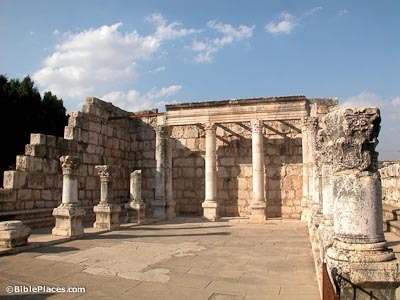 The synagogue in Capernaum is a typical Galilean synagogue. The doors face Jerusalem and the worshippers prayed in that direction. The Torah must have been wheeled around to the door area (see the inscription found with Torah on a cart). Later synagogues have doors which are located on the opposite side from Jerusalem. 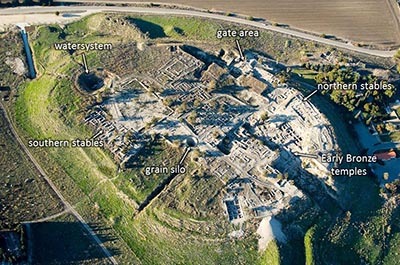 Megiddo has approximately 26 levels of occupation. The first inhabitation was during the Chalcolithic period, but only a few segments of houses have been uncovered. The earliest fortified city dates to the Early Bronze Age. Like other cities at the time, Megiddo in the Middle Bronze period had a lower city at the foot of the tell. Not much is known about it because the American excavators unknowingly placed their excavation camp on top of the lower city. During the Late Bronze Age, the kings of Megiddo were wealthy, as attested to by a collection of gold implements, ivory ornaments, and necklaces of gold and lapis lazuli found in Level VIII. A collection of more than 200 ivory plaques without parallel in archaeology of this country were found in Level VII (13th-12th centuries BC). 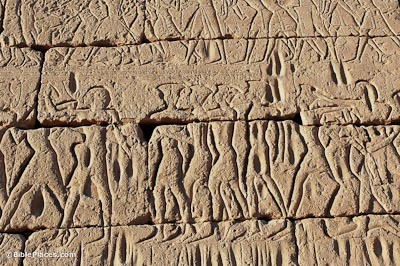 The Solomonic city was destroyed by Pharaoh Shishak. A fragment of a victory stele erected by Shishak found at the site is now on display in the Rockefeller Museum in Jerusalem. Megiddo fell to the Assyrians in 733 BC. 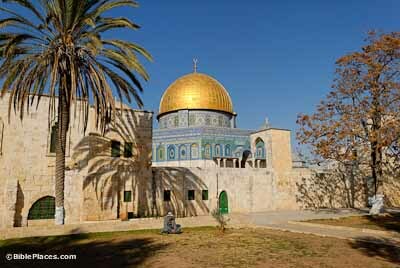 The inner dome of the Dome of the Rock is original and is made of wood. The structure had a lead dome from 691 to 1965. The oxidized copper dome, which looked like gold, was installed by King Ibn Saud in 1965. This was one of the things done in reaction to the Pope’s visit to Jerusalem in 1964. The copper dome was replaced by King Hussein (with money from Saudi Arabia) in the 1990s with one of pure gold, because the existing one was rusting and needed to be replaced. “In 1994 a new gold-plated exterior dome, weighing a total of 80 kilograms [180 lbs. ], was installed at a cost of $15,000,000. The plating is not more than .0023 mm thick, and the sheen of the gold was slightly muted during the plating so that the dome would not blind anyone gazing upon it” (Meiron 1999: 154). Sihon was defeated “from the Arnon to the Jabbok” (Num 21:24). In general, Reuben and Gad settled south of the Jabbok, as far as the Arnon, and half of Manasseh settled north of the Jabbok (Deut 3:12-17; Josh 13:31). 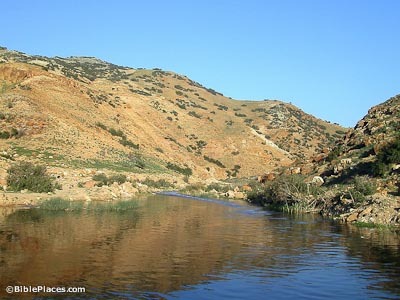 The Gadites, however, seem to be found wherever there is Israelite settlement in the Transjordan, including the area north of the Jabbok River. The Jabbok River split Upper Gilead in two, thus the references to “half Gilead” (Josh 12:2, 5). The Philistines are known by their feather head dress. The Philistines can be recognized because of their use of swan decorations, two-edged swords, spears, and rounded shields. The Egyptians on the other hand, used sickle swords and tombstone shaped shields. Philistine women and children are shown in ox-driven carts, indicating that the Sea Peoples were not only military invaders, but migrants. The majority of the Sea Peoples are clean-shaven, but a few Philistines are depicted with beards. The Great Theater of Ephesus was an important part of city life in Ephesus being on the route of the Artemis procession. After its completion by the Romans it seated 25,000 people. 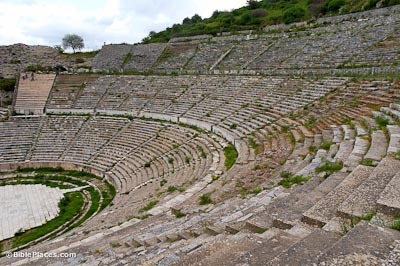 The existence of the theater can only be verified after 100 BC but it is likely it began in 133 BC with the establishment of the province of Asia. It most likely went through several stages of enlargement which were completed by AD 262 when part of the theater collapsed in an earthquake. The Roman tribunal where Paul was dragged before Gallio has been uncovered in the center of the agora. This was the bema, where Roman officials would appear before the public. In Delphi, an inscription mentioning riots in Achaia and Gallio’s name serves to date Gallio’s proconsulship to between AD 51 and 52. Had Paul’s trial been more formal, it likely would have been held at the North Basilica instead of the Bema. In Christian times, a church was built atop the bema. Some people from the area of Tyre came to hear the preaching of Jesus (Mark 3:8; Luke 6:17). Jesus sought refuge from the Jewish crowds in the vicinity of Tyre (Matt 15:21; Mark 7:24). Jesus claimed that if the miracles performed in Chorazin and Bethsaida and been performed in Tyre and Sidon, the two pagan cities would have repented (Matt 11:21-22; Luke 10:13-14). 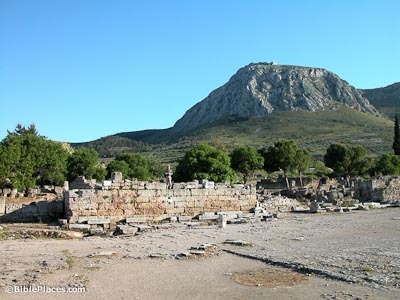 Herod Agrippa I died shortly after making peace with the people of Tyre and Sidon (Acts 12:20). 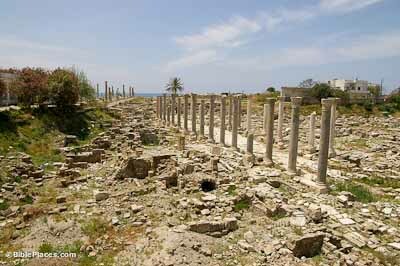 Paul spent a week in the city of Tyre on the return from his third missionary journey. The believers in the city urged Paul not to continue on to Jerusalem (Acts 21:3-7).